“Constructed culture sounds like conculture” explores the practice of five international artists, their individual approaches to storytelling, formally and conceptually and how the artworks they produce suggest a narratative world with its own set of rules, a constructed environment. When using the term “constructed”, one is prompted to think of a conculture or fictional culture. Constructed Culture is not synonymous with what social anthropologists define as a cultural construction; a shared understanding of some aspect of the world that exists because the people of a specific culture acknowledge and understand that thing to exist. Constructed culture sounds like conculture examines the work of five practices using various techniques to illustrate their individual, constructed worlds, which emerge out of their subjective and uncondensed experience. These experiences range from political investigations into a cultural dream, formal breakdowns of architectural elements, romantic journeys into the tropical and wild, to interests in social codes and re-writing the codes of a rollercoaster landscape. Darren Bader, Mia Marfurt, Adrien Missika, Lydia Ourahmane and Tabor Robak all integrate popular images in their works, in which glimpses of daily life and banal social observations help building narratives where traveling to exotic destinations, computer gaming, formalism, art history and mystic afterlives become the doors to an alternate existence. Such “pop” images are tightly edited in order to shape the story intended to tell, and influence its interpretation, and often propagate notions of home, identity or (be)longing. 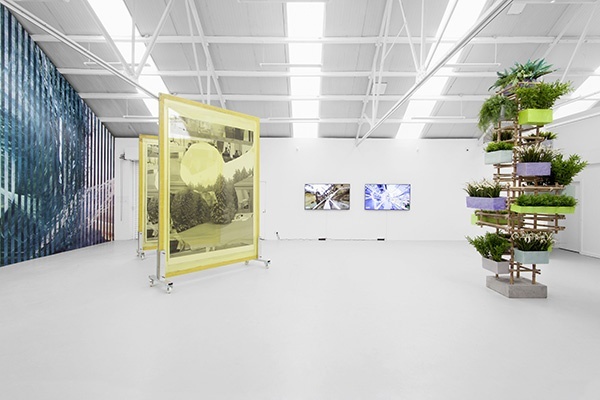 For SUSPENSION OF DISBELIEF Elín Hansdóttir produces a site-specific work, which uses the architecture of the former margarine factory as a starting point for a spatial and filmic installation. Hansdóttir places the viewers in the spotlight of her cross-genre installations. Over the past years, her artistic practice has shifted from sculptural concepts to dynamic spatial arrangements, which incorporate sound and light, but also address the changes in the viewers’ perception through their own movements as essential elements. SUSPENSION OF DISBELIEF is the first work by Hansdóttir in which the filmic experiment plays a key role. Employing acoustic and optical effects as well as architectural elements, her works explore the potentials and limitations of spatial experience. SUSPENSION OF DISBELIEF is funded by Medienboard Berlin Brandenburg. With additional support from the Icelandic Visual Arts Fund, the Icelandic Art Center, the Embassy of Iceland, and the Muggur Travel Grant.